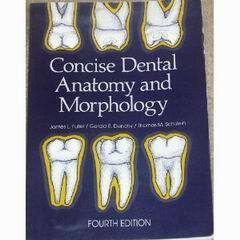 Concise Dental Anatomy and Morphology 4th Edition PDF Download Ebook. James L. Fuller shows sufficient knowledge in and successfully communicates using appropriate dental terminology. The student should know the meaning of terms generally used by dental practitioners while describing the morphological characteristics and structure of human teeth and their surrounding tissues. The contents describe the detailed morphology of the primary and permanent dentitions with an appreciation of the relationship of correct tooth form and position to the proper functioning of the teeth. It describes the eruption sequence of both the primary and permanent dentitions, the detailed relationship of each tooth to adjacent and opposing teeth when all teeth are in normal position as well as describe types of malocclusion. Author also shows the intra-arch relationship of the teeth and their effect on the health of the supporting structure by describing the morphological characteristics of the root structure for each of the primary and permanent teeth. The evolution of the primary and permanent dentitions is explained with the common tooth anomalies of the human dentition. This book also shows guidelines to evaluate the periodontium, and identify conditions that compromise periodontal health and function with an environment conducive to health by applying basic and advanced principles of dental hygiene instrumentation without causing trauma to hard and soft tissue.